A wedding cannot begin or end without a processional and recessional. 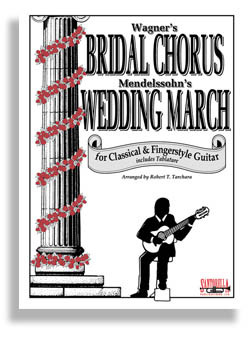 Bridal Chorus and Wedding March have been providing a backdrop for centuries bringing millions of couples to and from the altar. Felix Mendelssohn (1809-1847) and Richard Wagner (1813-1883) are directly responsible for these incredibly uplifting fanfares. The instruments may vary by personal choice, but this fingerstyle arrangement is sure to bring elegance and grace to any ceremony. This fantastic arrangement by Robert Tarchara is exclusively available from Santorella Publications.